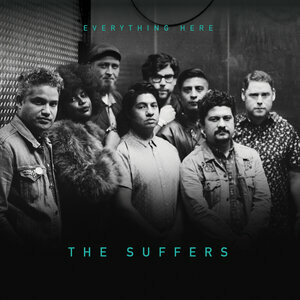 On The Suffers self titled debut, the group used a scattershot approach writings songs in various styles to show how well rounded the 8 piece Houston outfit were. On the follow up, Everything Here, the group reigned in most of that genre ranging sound, settling into a light soul style crafting a complete, record focusing on the pain, love, loss and coming together post Hurricane Harvey. The songs are all tied together by chimes, light percussion and easy grooves. There are multiple interludes with other Houston artists (Bun B, Paul Wall) and the groups mothers, tying the scene, love and family all together. The band, Kam Franklin (lead vocals), Adam Castaneda (bass guitar), Kevin Bernier (guitar), Jon Durbin (trumpet), Michael Razo (trombone), Jose Luna (percussion), Patrick Kelly (keyboards), and Nick Zamora (drums) sound slick and are constantly locked in. While the music may be polished and the overriding topic a weighty one, the lyrics are unusually light and breezy, to the bands detriment at times. Some songs consist on nothing more than a single thought or phrase, an example being "You Only Call" whose music sounds picturesque but whose lyrics never amount to more than that title phrase. Franklin is a top notch vocalist (listening to her flutter and show off her range on the bass driven "All I Want To Do" is impressive) yet lyrically there seems to be more G-rated surface level fun, rarely digging deep or leaving much of an impression. "Do Whatever" is simplistic, even though the children's voices correctly proclaim that it is fun while "The One About Sace" breaks done into almost conversation when discussing Friends and Martin quotes which is slightly off putting. "Mammas" is another sweet tune stating what should be obvious while Franklin gets to show off her torch song ready vocals on the string accented "Sure To Remain" and the piano lead "After The Storm". "After the Storm" is a duet with Lyle Divinsky from The Motet, and while pretty, it never gets much deeper than it's title statement either. "What You Said" delivers the goods with light 70's funk and the band gets to play with reggae on the title tune but it is that smooth soul sound which is the foundation for all of the other efforts. Each easy listening soul and R&B tune doesn't have to have world changing lyrical ideas, but by keeping topics surface level the tunes need to stand out to stick around in the brain. Fortunately, two do just that and they come at the beginning and the end of the record. "I Think I Love You" opens the band up on the record using warm organs and keen trumpet work before a slowed down bridge leads to a relaxed cool soul close that could be jammed out even more in the live setting. However, it is closer "Won't Be Here Tomorrow" that brings the power style and substance to record as the gospel influenced number swells with emotion before Franklin and company are joined by a full chorus of voices...before cracking up to end things. The final track showcases the power The Suffers can produce and while things are pleasantly executed throughout Everything Here, the band seems to still be working to put all of their strengths together.